LTH Home > Chat > Beyond Chicagoland > Montreal? Hi all, my wife and I might be going to Montreal for a few days. (oddly for a job interview). Any must not miss eating opportunities that anyone can recommend? You owe yourself a visit to Schwartz's, some St. Viateur or other Montreal-style bagels, Au Pied de Cochon, and the Marche Jean-Talon. We also really enjoyed Cafe El Dorado on the plateau, which had a really relaxed vibe, great coffee, and very good casual food. Do read the other threads, as there are a ton of great recommendations in them. With a little luck, our Montreal expert (and part-time resident), GEO will chime in. Ill keep my fingers crossed, If we have any experts I'd love to hear about life in montreal in general... it's sort of crazy to imagine living outside of the states but we might have to due to a job opportunity! bryangodwin wrote: Ill keep my fingers crossed, If we have any experts I'd love to hear about life in montreal in general... it's sort of crazy to imagine living outside of the states but we might have to due to a job opportunity! Geo can definitely give you much more & recent information on Montréal, but I grew up there (consider it my hometown) and visit 2-3 times a year. I don't know what industry you'd be working in or what type of cities you tend to like, but I think overall quality of life in Montréal is outstanding, certainly better than Chicago. (Though probably in Chicago for the long haul, I've retained my Canadian citizenship just in case I decide to move back. ) I grew up just off the main drag of Chemin de la Côte-Des-Neiges, not far from the Université de Montréal. My family was always within walking distance of restaurants--hole-in-the-wall places with loyal, lifelong patrons--serving delicious, cheap food from all over the world. Montréal is really culturally vibrant in other respects as well. It has outstanding film and music year-round in addition to its well known international film, jazz and comedy festivals. The Canadian Centre for Architecture--founded by a Seagram heiress--is excellent if you care at all about academic architecture. These are all things I loved as a resident, not just as a visitor. The cost of living is considerably less than most American cities, and public transportation is really good. Despite the politics that goes along with it, I feel extremely lucky to have grown up in a bilingual city--that in itself is an important quality of Montréal. Again, I completely defer to Geo's expertise, but if you have specific questions, I'm happy to try and answer them. Thanks for the info! I used to work in film and television, but now I design video games.. you might have heard but EA (makers of madden etc) closed their Chicago wing last week, so about 150 of us are either facing either transfer to other EA branches or finding a new gig. EA has a montreal branch, seems like it could be a fun adventure as much as I love Chicago and hate to leave it. bryangodwin wrote: Thanks for the info! I used to work in film and television, but now I design video games.. you might have heard but EA (makers of madden etc) closed their Chicago wing last week, so about 150 of us are either facing either transfer to other EA branches or finding a new gig. EA has a montreal branch, seems like it could be a fun adventure as much as I love Chicago and hate to leave it. Ah yes--I actually have been following the Electronic Arts news. Good luck wherever you end up! MJN of Hungry Magazine ( http://www.hungymag,com ) did a delectable series of articles on his culinary adventures in Montreal -- smoked meat, fried foie gras, and other delicacies mde me want to jump on a plane. The last article -- the one on the fried foie gras -- is on the bottom of the first page of travel archives, and then there are three more articles on the previous page. Old-school spot. Think Lou Mitchell's but smaller and a bit quieter, with a Jewish tilt. 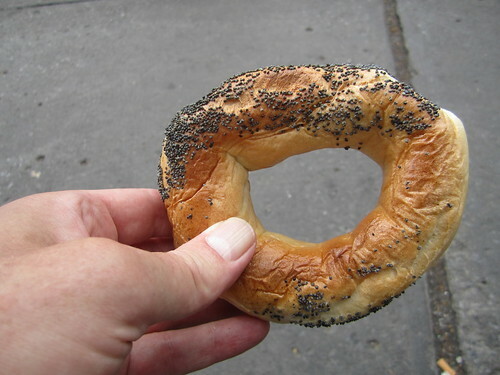 The Montreal Bagel is, in my opinion, far superior to the New York offering. Three sit-down locations are available, and identifed in the link above. I'm in the KC phase of my life (Aug to Dec) so I'm too busy to do much posting, but I finally came across this thread. As it happens, I'm in Chicago for the weekend--had dinner last night with C2, jlawrence et all at Ed's Potsticker--and will be in Montreal tomorrow (lord willin' and the crick don't rise!) for the American holiday week. Understand that you will always be a cultural outsider if you weren't born a Montrealer--the Francophone community is tighter than a drum that way. Think a small village in New England. But that being said, the folks are incredibly welcoming, almost surprized that any Yank would want to move there. They'll help you any way they can, esp. if you ask. If you don't speak French, learn how. Although all the young folks are bilingual, their elders aren't; besides, it's their language, their culture, their city. Of course there are solid, centuries-old and full of tradition Anglophone communities in the city. But my wife and I elected to jump into the Francophone culture feet first, w/o a parachute. We don't regret it. As a gamer you'll be among a huge sub-culture, as I'm sure you already know. The techie sub-culture is large, a major ingredient in the city, and will form a ready-made community for you. Your transition will be relatively smoothed by this. It is a fabuluous city, one of the most fascinating in the world. It's unbelievably dealable-with, from transportation to shopping to culture and aesthetics. If you have a chance to live there, take it. You'll never regret it for an instant. Besides, as a thinking person, it's always good to get some perspective on one's homeland--and for a Yank, no better way to do that than to spend some time in Montreal, among friends, but ones who will tell you what they're thinking. Heading to Montreal for four days. Any more recent suggestions? We are staying in an area that seems to be known as the Golden Square Mile. Is that along that lines of the Magnificent Mile here? Meaning bring lots of $$? Cinnamon Girl wrote: Heading to Montreal for four days. Any more recent suggestions? We are staying in an area that seems to be known as the Golden Square Mile. Is that along that lines of the Magnificent Mile here? Meaning bring lots of $$? Thank you, lots of good leads there. And one of the best meals I have ever ever had was at Chez L'Epicier in Old Montreal where the food was brilliant but the atmosphere so friendly and relaxed. I dream of that meal often ...http://www.chezlepicier.com/index.php?lang=en they do a tasting for $85 CAD but you can go for less as well. Schwartz' Deli for smoked meat. Lived up to the line, and the hype, on my visit. Smoked meat is like a cross between corned beef and pastrami, and not widely available in Chicago. spinonejay wrote: Schwartz' Deli for smoked meat. Lived up to the line, and the hype, on my visit. Smoked meat is like a cross between corned beef and pastrami, and not widely available in Chicago. Try Wilensky's for "The Special" - Grilled bologna with a little mustard on rye. No substitutions allowed, or needed. They even still have real fountain drinks. A leftover from the Duddy Kravitz era of Montreal. We were speechless with disappointment after a recent visit to Schwartz's. And I'm not blaming new owner Celine Dion. Maybe we just got it on a bad night. David Hammond wrote: new owner Celine Dion. David Hammond wrote: We were speechless with disappointment after a recent visit to Schwartz's. And I'm not blaming new owner Celine Dion. Maybe we just got it on a bad night. Possible. I just had it in March, and it was fantastic. Biking around Montreal last month, we stopped at St. Viateur-Bagel [http://www.stviateurbagel.com/], a place where for about a buck you can have a bagel that’s been hand-rolled and freshly pulled from a wood-fired oven. Though a touch drier – and perhaps less consistent – than bagels cooked in a regular industrial oven, these dough rings had a pleasant light smokiness and satisfying chewiness. Later, at home, I checked the website for this place and found that it’s apparently a kind of institution: the site features words of approval from celebrities including Anthony Bourdain, William Shatner, Celine Dion (the new owner of Schwartz’s! ), and others. I kind of thought we “discovered” this place, but apparently a few others have visited there as well. 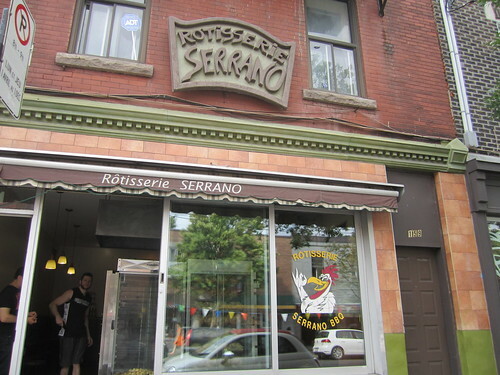 Across the street from St. Viateur-Bagel is Rotisserie Serrano, one of many roasted chicken places in Montreal that seem usually to be owned by Portuguese. 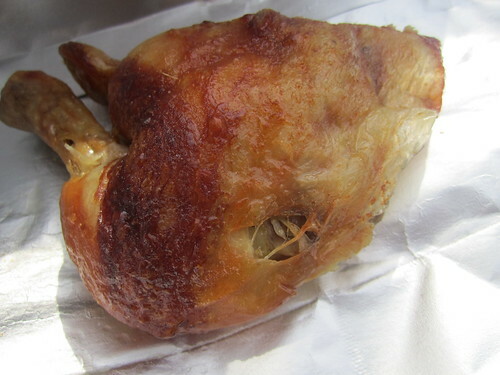 I bought a “leg” there that was probably over a quarter-pound of meat, a beautiful segment of roasted bird, a few bucks and a perfect complement to the bagel. This is the way I like to eat when I travel: randomly, frequently serendipitously, encountering little places I’d never heard of before…and then eating whatever they’re serving. 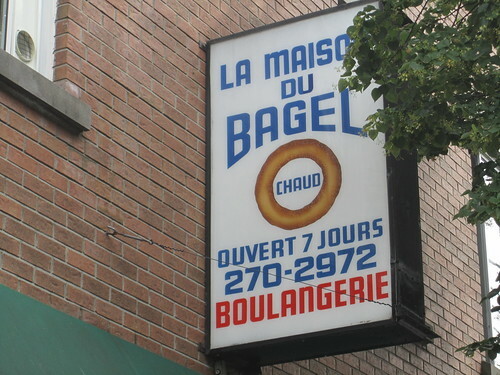 There's a long standing debate amongst Jewish Montrealers between St. Viateur and Fairmount Bagels. I find little to differentiate them. Schwartz's, for me, was mind-blowing. Loved the place (it was in 2011 when I visited, though). Maybe the best smoked cured beef I've ever had. But, also, down the street I loved Charcuterie Hongroise. They had the best debreceni sausages I've had outside of Hungary. I'm surprised at Montreal being characterized as cheaper than Chicago. We personally found it a bit more expensive. Binko wrote: Schwartz's, for me, was mind-blowing. Wife and I had a very solid meal at Restaurant Le Lai. It bills itself as Vietnamese & Thai but I feel that the menu was heavier on Thai dishes. The restaurant is Thai owned, which , according to our waiter is unique in that there are very few Thai establishments in Montreal because few Thai can speak French. We started with an order of Imperial Vietnamese rolls. Essentially fried spring rolls but they were delicious. I had the Thai chicken salad (extra spicy). Wife had her normal order of Pad Thai. Both dishes were very well done, particularly the pad Thai. It wasn't the typical version that we are used to. It had a variety of vegetables that isn't normally associated with the dish (carrots, onion). It also wasn't served with lime or peanuts. In face the restaurant didn't have any lines in house. We were offered lemons but no lines. The chicken salad was similar to nam sod but served over noodles as opposed to lettuce. It was spicy as requested and delicious. The prices were very reasonable and the staff was accommodating. Obviously you could do much better in Montreal but given the fact that we were road weary (driving from Quebec City) and it was late on a Monday evening Restaurant Le Lai filled the bill. Cons: it's been running on auto-pilot for at least 20 years, back to when I first got there. Never forget: when ordering a pastrami, corned beef or smoked meat sandwich, ALWAYS specify NOT lean!!! Else what you get is guaranteed to be dry --and cry out for commission of a shanda (a sin), the application of mayo. nuff said?